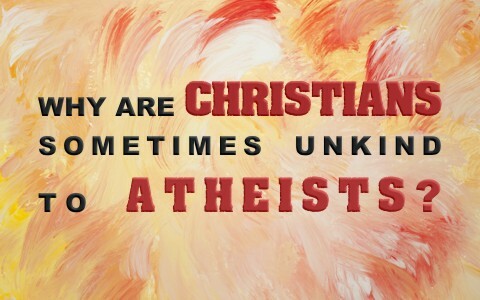 Why Are Christians Sometimes Unkind To Atheists? Why do some believers treat unbelievers in such a horrible way? Are they responsible for their unbelief? If we respond without love to those who disbelieve, we are breaking a command of God because we’re told to “bless those who curse you, pray for those who abuse you” (Luke 6:28), and “Love your enemies and pray for those who persecute you” (Matt 5:44). If we understand the biblical doctrine on salvation, we’ll discover that, even though unbelievers are without excuse because they are suppressing the knowledge of God, (Rom 1:18-20), “The natural person does not accept the things of the Spirit of God, for they are folly to him, and he is not able to understand them because they are spiritually discerned” (1st Cor 2:14), so to try to force someone to believe in God is something they can’t do without God’s Spirit. It’s simply impossible. We were dead in our sins until Christ raised us up to eternal life (Eph 2:1-5), so it’d be like scolding a blind man for running into something. We can’t expect the blind man to see, since the “gospel is veiled, it is veiled to those who are perishing. In their case the god of this world has blinded the minds of the unbelievers, to keep them from seeing the light of the gospel of the glory of Christ, who is the image of God” (2nd Cor 4:3-4). The best thing we can do for unbelievers is to pray for them, not give up on them, and remember that they’re blinded by the god of this world, even if it’s a god they don’t believe in. If we are receiving persecution for our faith, remember that we were once as they were, and it was only because God saved us that we can now see and are no longer blind, so Paul reminds us that “the sexually immoral, nor idolaters, nor adulterers, nor men who practice homosexuality, nor thieves, nor the greedy, nor drunkards, nor revilers, nor swindlers will inherit the kingdom of God” (1st Cor 6:9b-10), but to keep us humble, he wants us to think back, and remember that, “such were some of you. But you were washed, you were sanctified, you were justified in the name of the Lord Jesus Christ and by the Spirit of our God” (1st Cor 6:11). If we think we were special and that’s why God called us, we don’t know the truth about humanity (Rom 3:10-12). Can you tell anyone why God saved you? I cannot, so think about this. The kind of people God saves will flatter none of us. Paul writes, “God chose what is foolish in the world to shame the wise; God chose what is weak in the world to shame the strong” (1st Cor 1:27), and “God chose what is low and despised in the world, even things that are not, to bring to nothing things that are,” (1st Cor 1:28), and why was this? It was “so that no human being might boast in the presence of God” (1st Cor 1:29), and I would add, boast in the presence of others. If that sort of takes the wind out of your sails, I’m sorry, but we must remember that “None is righteous, no, not one” (and that includes you and me) (Rom 3:10), and “no one understands; no one seeks for God” (Rom 3:11), and not most, but “All have turned aside; together they have become worthless; no one does good, not even one” (Rom 3:12). This means that there are no exceptions, since “no one is good,” and “all have sinned and fall short of the glory of God” (Rom 6:23), and again, “all” means everyone and there are no exceptions. Maybe that’s why Paul says, “not even one” is good, to make it clear to that one guy who believes he’s the exception. That should destroy any idea of our being special or “spiritual,” and that’s why God called us. Some have even argued that they had been seeking God all their lives, but it was actually God seeking or pursuing you, so we ought to thank God for that because dead bones don’t seek after anything but decomposition, and we were dead (Eph 2:1). If we are ever going to show the love of Christ to others, we’re going to have to look, act, and talk like Jesus did. Jesus told His disciples, “A new commandment I give to you, that you love one another, even as I have loved you, that you also love one another. By this all men will know that you are My disciples, if you have love for one another” (John 13:34-35). There is so much to unpack in these two potent verses. First, it’s not a suggestion from Dear Abby that you love others. It’s not even just a good idea. Jesus commands us to love one another and this is not just a superficial love. We are to love one another just as Jesus loved us, and what did that look like? You know (John 3:16). This is a love that Jesus had; He prayed for the Father’s will, even when what was coming was horrific (like in the Garden of Gethsemane); He came not to do His own will but the Father’s will (John 4:34, 6:38); and He willingly gave His life as a ransom for us who trusted in Him (Mark 10:45). He willingly died for us, and truly, there is no greater love than to die for ungodly wicked sinners who were enemies of God (Rom 5:6-10), and lest we forget; some of such were we! So we are commanded to love one another with the same type of godly (agape) love that Jesus showed His disciples and showed to us who have trusted in Him. It may not mean actually dying for them, but it may mean killing your own self-interests and putting the interests of others ahead of our own (Phil 2:3). Next, John 13:34-45 tells us that it is by this kind of agape love that “all men will know that” we are His “disciples.” It’s not by the Bible archeological evidence we present, nor the authenticity of the thousands of manuscripts we have, and not even the Word of God itself. It takes the Spirit of God and the Word of God, but when we add the love of God, something happens: All men know. They may know and still reject it, but “all men” sounds to me like it includes everyone; believers, atheists, agnostics, and those of other religions. Here is some related reading for you: Should Christians Engage in Arguments with Atheists? Hello Bethany. I have subscribed you and you can unsubscribe at any time. Your first newsletter may come in your junk or spam folder. Thank you. Previous post: Is America Headed For Another Race War?